Markets continued higher yesterday led by the Dow as it closed at a new all time high on the back of strength from IBM’s $15 billion buyback announcement. Consumer staples continue to rip higher, standing out as the clear leaders as people rotate back into slow growth yield sectors due the to fall in rates we’ve seen since Bernanke’s no taper decision. Home builders, energy and semiconductors also showed notable strength while regional banks and IYR showed some weakness closing down on the day despite a relatively strong tape. Gold continues to base above 1340 but gold miners closed down 2.5% as they look to test the 8 day in today’s session. The pain trade continues as the market continues to melt up, not giving shorts any type of significant reversal candle or move below the 8 day EMA. I still think we see an opportunity to try a cute short after today’s FOMC statement. Everyone seems to be on the same side of the fence, expecting no change to the policy but we may get a sell the news type reversal intraday. Still some decent long set ups out there for cash flow trades as we digest at all time highs. I’m still long NOV13 13 VIX calls from 1.65 and JCP from 8.99. SPY continues to plow through any and all resistance on below average volume as we continue to melt up above ’09 channel resistance. Wouldn’t be looking to initiate new longs at ATH’s but there are setups in individual stocks. Looking for a reversal candle here to try a short as we are extended here, though that hasn’t mattered much in 2013 if your timing is incorrect. Still expecting a pullback, possible sell the news type day on Wednesday as the FOMC statement usually causes some volatility. Still long the VIX and JCP, as the VIX maintains a higher low while SPY grinds higher. Weakness evident in the pro-growth sectors of IWM and QQQ as slow growth staples (XLP) lead to the upside. Get short when we see a move on heavy volume and see the broader indices hold lower for a longer period than a few minutes. My apologies for the lame update, school is hectic, but I will try to post more consistently once I get caught up on work. DXY breaking support to the downside and failed a backtest of channel resistance. RSI divergence on the daily suggesting a bounce soon, but longer term, the weekly chart suggests more downside. If long use last week’s low as a stop. EURUSD continues to ride the 8 week EMA higher as it breaks out of a long term symmetrical triangle. Remains bullish above the 8/13/21 week EMAs. GBPUSD conslidating at the upper end of a long term wedge as it attempts to break to the upside. Price action remains bullish as it consolidates above the 200 week EMA and will likely find support from a rising 8 week EMA this week. Market breadth continues to improve in the short term as stocks in the S&P 500 above the 50 day sits around 80%. Stocks in the S&P 500 above the 200 day approaches resistance, will have to see how it reacts to that area. NYAD and NYUD finally making new highs with the market. We continue to grind higher on the backs of fewer and fewer stocks which leaves me concern that on a retest of upper level support areas, we may see a breakdown in market breadth indicators. 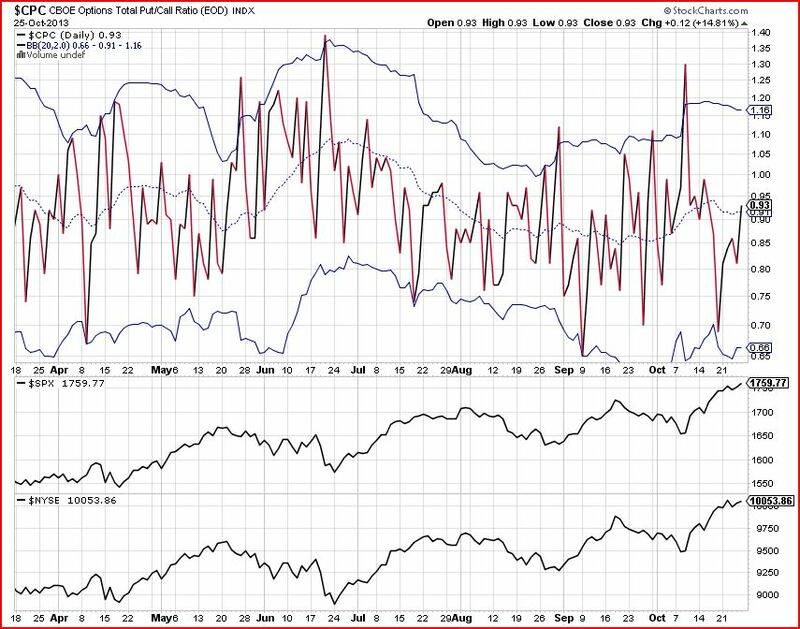 Put/Call ratios bouncing off the lower BB without a pullback shows people buying protection as fear of a pullback is muted by this slow grind higher by the major indices. 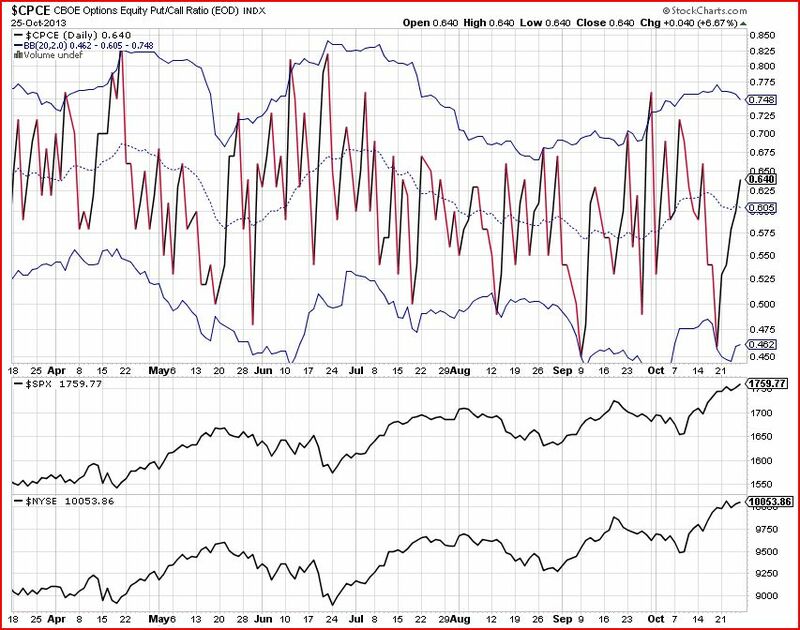 Overall, market breadth improving, but still has some major work to do before we can claim victory for the bulls. At the end of the day, price pays, but it remains important to be aware of market breadth as we hit new highs on the major indices everyday it seems.